Beard not included. 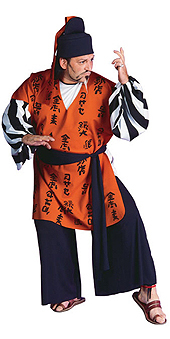 Samurai costume will fit from size Mens Medium to size XXL using tie in waist. This simple Samurai costume shows the warrior class in style and can have you using time-honoured techniques to defeat your enemies. When you play samurai with one of the orient inspired costumes you'll take on the patience, control and power which comes with serving the daimyo.